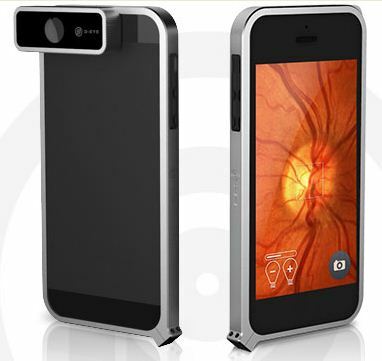 D-EYE is Introducing the only portable ophthalmoscope capable of recording and transmitting high-definition images and video of the eye using the smartphone. A revolutionary new device called the D-EYE could change the lives of millions of people. The World Health Organisation (WHO) estimates that 80 percent of visual impairments suffered worldwide could be prevented or cured through standard eye examinations and care. Its easy install on the smartphone, just download the smartphone app, affix the mounting bumper and D-EYE lens, set up patient/exam file, focus the phone’s camera and begin recording. It’s that easy, that simple. The D-EYE is a lens that clips onto the back of a smartphone (right now it works with the iPhone 5, 5s and 6, and the Samsung S4 and S5). It's non-invasive, simple to set up, and requires no power to run, so it can work anywhere. With the accompanying app patients can then film their own examination, which is sent back to a specialist over the web. Thanks to the innovative mounting bumper, eye lens and retinal imaging system that make up the D-EYE, you can essentially carry an optometrist's fundus camera around in your back pocket. "Conduct routine eye examinations and retinal screenings anywhere for possible detection of a variety of disorders, including the leading causes of blindness - cataracts, glaucoma, diabetic retinopathy and age-related macular degeneration," the inventors explain on the project's official site. The gadget has been developed by ophthalmologist Andrea Russo together with and Italian tech development firm Si14 SpA. Once the link between doctor and patient is established, doctors are able to remotely control the device to choose where in the eye to look, as well as set and review patient files. It provides a comprehensive view of the inside of the eyeball (including the retina, optic disc, macula, fovea and posterior pole).